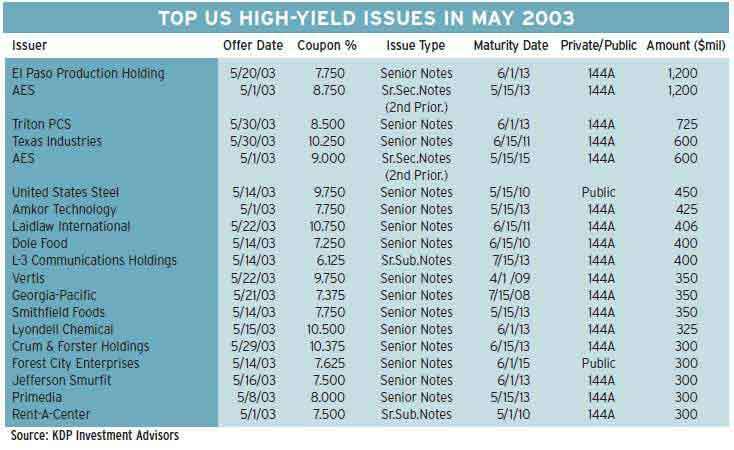 Corporations with lessthan- perfect credit ratings are rushing to borrow in the US high-yield bond market to refinance outstanding issues at lower rates and to avoid using bank loans, analysts say. 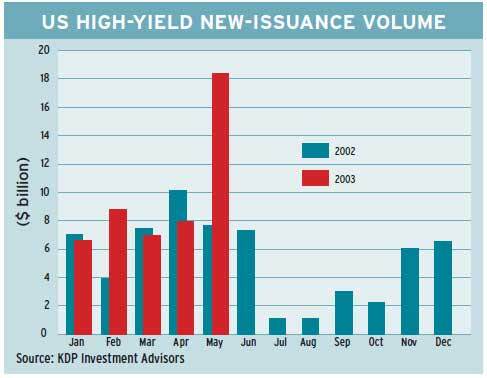 New-issuance volume soared to a monthly record of $18.4 billion in May, according to Vermont- based KDP Investment Advisors. The low level of interest rates continues to entice borrowers at a time when investors are seeking diversification, which is opening the market to more names, says Dennis Adler, corporate bond analyst at Citigroup in New York. The front loading of borrowing that normally would be done at a later date is another reason that the volume of new bond issuance has soared. Arlington,Virginia-based AES, the global power company with generating assets in 28 countries,was the largest issuer of high-yield securities in May.AES completed a private offering of $1.8 billion of second-priority senior secured notes. The notes were issued in two tranches: $1.2 billion of 8.75% notes due in 2012, and $600 million of 9% notes due in 2015.
AES used the proceeds of the placement to purchase outstanding senior and subordinated notes in a tender offering and to repay $475 million under the company’s senior secured credit facilities. “The completion of these transactions is another major step in AES’s plan to strengthen the balance sheet, improve financial flexibility and increase liquidity,” says Barry Sharp, chief financial officer. The transactions substantially eliminate all scheduled parent maturities at AES until 2005 and lengthen the average life of the company’s debt maturities. El Paso Production Holding, a subsidiary of Houston, Texas-based El Paso, the largest natural gas pipeline company in the US, closed a private placement of $1.2 billion of 7.75%, 10-year unsecured notes with registration rights. El Paso used the proceeds to repay early its $1.2 billion, 9.75%, twoyear secured interim term loan that was completed in March 2003. “The significant reduction in borrowing costs on this transaction relative to the March term loan reflects the improvement in the company’s liquidity, substantial progress on asset sales and a clear path to future debt reduction,” says Dwight Scott, El Paso executive vice president and CFO. Pennsylvania-based Triton PCS, which provides digital wireless phone service in the southeastern US, issued $725 million of 8.5% senior unsecured notes due 2013 in a private placement. The company will use the net proceeds to retire its 11% senior subordinated discount notes due 2008 and to fully repay outstanding borrowings and terminate its existing senior credit facility. Triton PCS has received commitments to put in place a new $100 million revolving credit facility.